Throw your child the ultimate Minecraft birthday party! I’m sharing Minecraft party ideas and some free printables for you to use at your own Minecraft themed party. Do you have a Minecraft obsessed child in your house? Build the party of your child’s dreams with some of these Minecraft birthday party ideas! When my son starts talking about spawning and teleporting and potions my eyes glaze over. When I asked him what theme he wanted for his birthday this year I braced myself because I was pretty sure I knew what he was going to say. I was thinking to myself, “Please don’t say Minecraft. Please don’t say Minecraft.” “Minecraft. Of course.” Yes, of course it has to be a Minecraft birthday party. It’s not that I don’t appreciate how much fun he gets out of it because I do, but from a party planning perspective there’s just not a whole lot to work with. I thought. Once I got into it I did have fun with the theme and ended up with a party that eight 11 year olds thought was pretty darn cool. One of the dads came up to me and said I should be a party planner. Well, thank you! Here’s my card. I did take that as a big compliment and he laughed once I told him what I do. I had my son give me a list of important elements in the game and the best food in Minecraft. I set out to create a food table around those items along with Minecraft food labels. Granted most of the stuff was junk food but to be honest, the kids ate the carrots first. There was a lot of candy left over. Cookies, Coal (made out of Rice Krispie treats tinted black, and Rolos & Nuggets. Rock candy for diamonds and emeralds and Hot Tamales and Red Hots for red stone. I saw a picture of golden apples Roni of Roni’s Sugar Creations made for a client and asked her to make me a dozen golden apples for the kids. They are not only beautiful but taste so good! I have to say that the apples did not look quite like this when I picked them up. There were smooth and shiny without any holes but it was so hot that the sugar was separating. The kids did not care one bit. 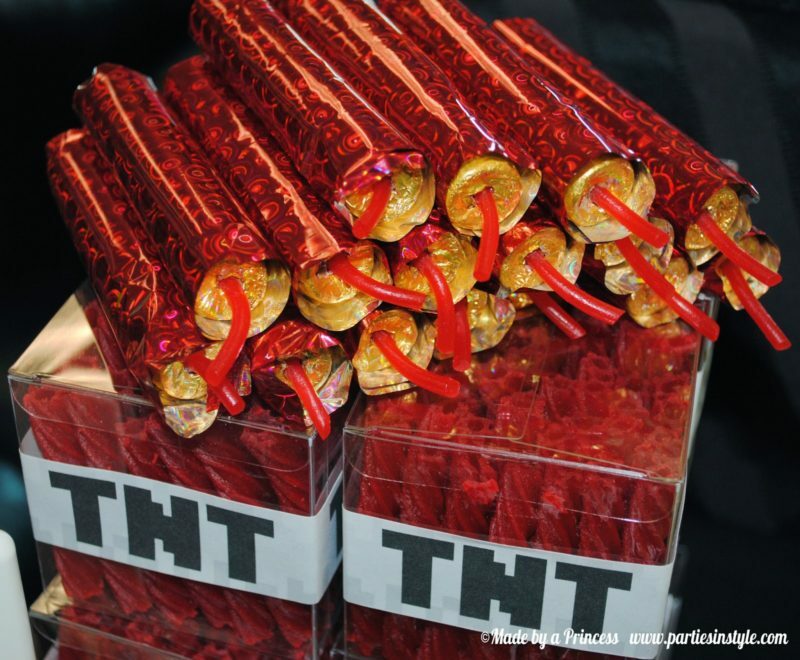 Make TNT boxes out of licorice and dynamite sticks out of Rolos. The wick is made with Twizzlers. Create a brewing station with small seltzer bottles (found at Walmart) as well as some syrup bottles for snow cones. Choose flavors based on potions in the game like blue for Swiftness and green for Poison. Glue images to a small presentation board and make it stand out with green paper. I have done that experiment where you drop a Mentos in coke and it blows up so thought maybe the same thing would happen to the seltzer water as well. Upside: kids loved it! Downside: big mess so it is definitely an outdoors thing AND it flavors the water minty so the kids won’t drink it. It made my son and his friends happy so I call it a game point for Mom. Make a giant Creeper face made out of paper plates! This is the perfect backdrop for a photo booth. A Creeper face this larger will take four packages of plates and five foam boards from Dollar Tree. This was not my original idea. Another crafty mom, Kellie H., did it first. You can download the template I created to construct your own Minecraft paper plate backrop! Make your own Minecraft photo props! It’s not hard to DIY photo booth props. All you need is a little time, paper, an x-acto knife, and sticks. Straw work well too. Kids and adults loved the Creeper face backdrop! Minecraft characters pictured here are Enderman, Ghast, Creeper, and Steve. The Perler craft was a big hit too. A few days before the party my son and I created some samples for the kids to follow. It does take a bit of practice but it was a great activity. Tip: do not use wax paper, only use parchment paper. I am not a baker but I will do everything I can to make the best cake possible for my kids. The birthday boy decided he wanted a TNT cake. Ooookay. Got it. I printed a few pictures of the Minecraft TNT thingy and did my best to match the colors and features. Like I said, I am not a baker but my son was so over the moon excited the little things (maybe not so little) didn’t matter a bit. My favorite part of the whole party was the look on his and the other kids’ faces when they turned around and saw the cake “blow up”! They had never seen one of those sparkler candles before and it was priceless. Best $5 spent for the whole party! You can find these online but Amazon does not sell them any longer. I also glittered birthday candles in Creeper colors. Even boys need a little sparkle! Post updated 6/21/18: It’s hard for me to believe that it has been five years already since we threw my son a Minecraft birthday party. Next week my son will be 16…where does the time go?! Need more Minecraft birthday party ideas? Click the image below. You can check shop my Minecraft Store or click the links below to purchase. Thanks for sharing!!! Loved it all!!! What a great mommy you are!!! Definitely will use some of your ideas!!! Hello, I am wondering whether you have the list of the perler bead colors you ordered. Perler craft that you created looks great. Did you order sand or peach for Steve’s face. This party is awesome and a huge source of inspiration for my son’s party, My email address is kbrumley80 at gmail.com – thank you in advance! Also wondered about the perler beads…did you just order one of the assorted “buckets” or individual colors? If so, could you please tell me which ones? Some are pretty obvious but not sure on all of them. I’d really appreciate it! Thank you! Thank you for posting this. You did an awesome job! How did you make the photo props? I’d love to do something similar! Where did you get the clear serving bowls? They are perfect!